Good bye paper notes... free outliner software to administer all sorts of texts and calculations! We live in an information age with waves of notes, e-mails, documents as well as endless calls and meetings. To have information only one mouse click away therefore is the basis for sucessful decisions. MemoMaster serves as structured filing system for text information of all kinds that is based on hierarchies. 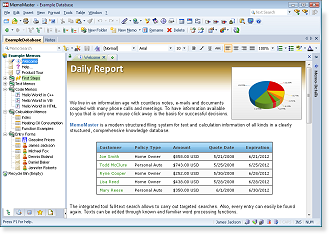 Notes, calculations, tables, forms, pictures, links and files are stored in the Memos. The layout of a Memo database can be created by using folders, sub-folders and Memos in a tree structure. The integrated full-text search allows you to do research quickly and effectively. The usage of MemoMaster is universal. MemoMaster allows you to administer non-fictional texts or useful descriptions, ideas, scrap texts, charges, addresses or recipes. You may also arrange organizational instructions, archive support databases or entries according to date. Create own entry forms with a few mouse clicks only and use them as a database within the database. Whether the information management software MemoMaster is used privately or business-related, with MemoMasteryou will be able to create and administer a pool of knowledge and information, which will be accessible personally, commonly for all of your company's employees or for your team. ...or simply as Knowledge Storage for your Ideas, Notes and Thoughts. For a detailed comparison chart of all editions click here.